Managing cash flow is key to your private practice business success. Running a practice involves learning many new skills outside of our clinical and academic training. As we embark on that journey, we are forced into situations where we must learn new things, often the hard way, but there are alternatives. Learning from the experiences of others is one way to plan better, acquire skills before they are needed, and be prepared for the challenges to be encountered. And this is true no matter what stage a practice and owner are at. There are new challenges at each stage of growth, not just at startup. At every stage of your practice, managing cash flow and money, as well as communicating value, are critical skills to be mastered. Managing cash flow is the job of the founder and CEO of any small business. It is a necessary skill that all founders must master in order to remain in business. I was once told that another crucial job of the CEO is to create a space between income and expenses, to protect your profit margin. This is also crucial to your long-term survival and your sanity. One has everything to do with timing, and the other shows up on your Income Statement or Profit & Loss Statement (P&L). They are two distinctly different things that often get confused. Outpacing your cash flow is a serious potential problem for successful businesses. Expanding too fast without thorough and adequate planning and resources can put you in a precarious position, even if your P&L looks healthy. Tim Spooner of Spooner Physical Therapy in Arizona shares, “Without cash, you have no business. I outgrew my cash once and that was painful.” Ironically, and partially because we realize income on a delay, adding staff, equipment, and locations in order to accommodate robust demand can put you in a position of having a great deal of business and no cash on hand. Planning for success is crucial to ensuring you can cover expenses when they are due. Cash and money have to be considerations in making strategic decisions around your business. I separate the two because money means revenue related to the P&L and the potential for recovering any outlay of cash and generating a return. Money shows up on your P&L. But even with a healthy P&L, timing of cash flow can harm your business if not done well. 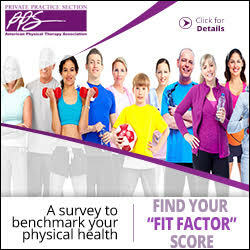 Your plan for positive revenue may be solid, but the cash may have already gone out the door in order to hire that new Doctor of Physical Therapy (DPT), buy the equipment, invest in marketing, or hire a business coach. Jim Hoyme of Therapy Partners in Minnesota puts it this way, “While money can’t drive your decision making and behavior, you have to always respect that it is necessary.” He goes on to share that “Though money is a critical factor, you have to balance it with clinical excellence, patient engagement, and employee engagement.” There are other considerations in play, and as providers of health care, we have to balance these considerations when making decisions. If we disregard the cash and money aspects, we may not survive to continue to help people when they need us. And don’t confuse activity with results. “Neither effort nor activity always equals money. Focused effort and value yields money. 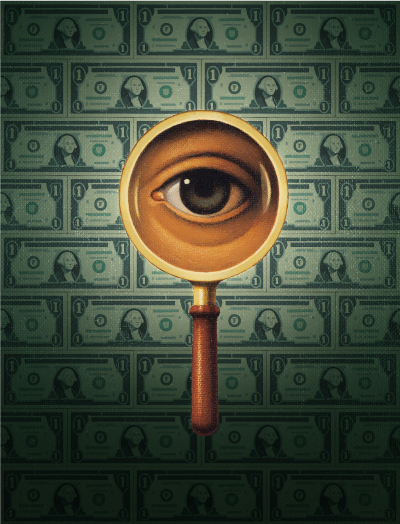 Money may not be the primary driver, but expenses, salaries, and more education expenses [for those entering the profession] make it necessary,” says Spooner. It’s simply the reality of running a practice. 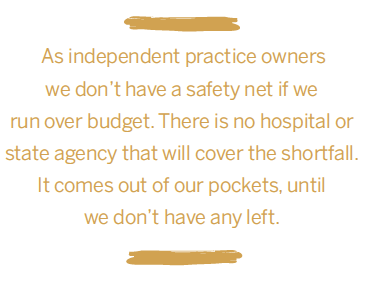 As independent practice owners we don’t have a safety net if we run over budget. There is no hospital or state agency that will cover the shortfall. It comes out of our pockets, until we don’t have any left. So, money matters. Cash, while not king, is critical to the survival of your practice. Having cash on hand, and a plan to continue to generate more revenue than expenses, provides freedom and the flexibility to pursue new projects, initiatives, marketing efforts, and strategic planning. Justin Carson of Jackson County Physical Therapy in Oregon says the most important cash and money lesson he has learned growing his business is having cash on hand. “The importance of being debt free and building a reserve so we can respond to changes and take advantage of opportunities” is most important. In an ever-changing health care environment, his lesson is well taken. Having cash on hand, a reserve, will allow Jackson County Physical Therapy to adapt to external changes and innovate change without being constrained by a lack of resources that might be holding back others in his area. And remember, you can only spend it once. Whatever resources you have, once you’ve spent it, it’s gone. This goes equally for time and money. Planning and being deliberate about your efforts, activities, and where you spend your resources can help assure positive results. In the interviews leading up to this article, the idea of value came up on several occasions. It is directly related to the money matters theme in that the perception of value is directly related to what patients will pay for. Making sure we, as physical therapists, are effectively communicating the value we provide is critical to the ongoing success of our concerns. People will spend their time, energy, and money for what they value, what they want. If they do not see value in your offering, they will not pay. Though there are many steps to the customer life cycle, and they all impact your cash flow and revenue, communicating the value you provide is one of the first to be mastered; otherwise the patients won’t come and there will be no life cycle. And the easiest way to start or improve on this part of your process is to ask your patients. Ask them what they value and how you can do better. Ask them why they came to see you and what their desired outcomes are. What do they want out of coming to your practice? It may seem obvious, but by being open to their answers and truly listening, you create an opportunity to learn new things that will lead to making your patients happy, improving your value proposition, and ultimately increasing your revenue.